Wider Grooves, Superior Sound: Mobile Fidelity’s 45RPM Edition The Last Word in Analog Fidelity! Dylan’s Second 1964 Album Expands Songwriting Themes and Adds Levity. Recorded in One Day: Whimsical Feel, Surrealist Lyrics, On-the-Fly Fluidness Grace the Bard’s Loosest 1960s Effort. Includes “I Shall Be Free No. 10,” “It Ain’t Me Babe,” “My Back Pages,” “Chimes of Freedom”. The ever-evasive Bob Dylan never explicitly stated exactly what represented the “another side” of himself referenced in the title to his second 1964 record. Yet the whimsical moods, hallucinogenic prose, humorous angles, transparent mistakes, and noncommittal themes give a pretty clear idea at what the Bard hinted as he emerged from being labeled as a reluctant generation spokesperson and folk savior after releasing two highly intellectual, socially pioneering sets replete with protest songs. Dylan needed to take a breath, step back from the drama, and reevaluate his surroundings. Another Side of Bob Dylan is all that and more. 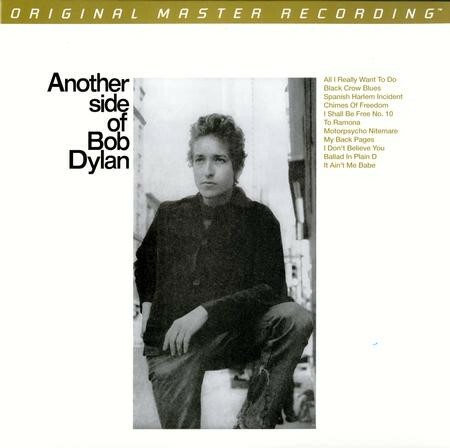 As part of its Bob Dylan catalog restoration series, Mobile Fidelity is thoroughly humbled to have the privilege of mastering the iconic LP from the original master tapes and pressing it on 45RPM LPs at RTI. The end result is the very finest, most transparent analog edition of Another Side of Bob Dylan ever produced. Be there as the Minnesota native spends the evening of June 9, 1964 in Columbia’s Studio A and, displaying an openness he’d never before revealed in a formal environment, lays down the songs that compromise his fourth album. And so the apparently autobiographical and self-aware “My Back Pages,” one of the earliest examples of Dylan’s immersion into symbolist prose and abstract metaphor, remains controversial for its on-the-surface denouncement of his earlier condemnations of social institutions and injustices. Peeled back, the tune is a brilliant release—an essential escape hatch for Dylan to both relieve himself of unneeded pressures and distance himself from pundits. As an indelible piece of art, it succeeds in masquerading obvious meaning while simultaneously forcing listeners to question their own actions. Quintessential Dylan.